USES: This medication is used to treat mild to moderate acne. It may be used in combination with other acne treatments. When applied to the skin, benzoyl peroxide works by reducing the amount of acne-causing bacteria and by causing the skin to dry and peel. HOW TO USE: Read the Patient Information Leaflet if available from your pharmacist before you start using this product and each time you get a refill. If you have any questions regarding the information, consult your doctor or pharmacist. There are many benzoyl peroxide products available. Many can be purchased without a prescription. Some products (such as cleansers, foam, or lotions) may require a prescription. Consult your doctor or pharmacist on the choice of the product that is best for you. Some products require shaking before use. Check your product package to see if your form of this medication needs to be shaken. Apply benzoyl peroxide to the areas of your skin affected by acne. Avoid getting this medication into your eyes, inside your nose or mouth, or on any areas of broken skin since it may cause irritation. If this occurs, flush the area with plenty of water. 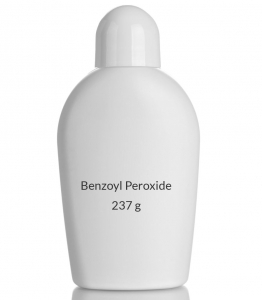 Benzoyl peroxide may bleach hair or fabrics. Use carefully, and avoid contact with hair, clothing, and furnishings. If using cleansers containing benzoyl peroxide, wet the affected area. Gently rub the cleanser into the skin for 10-20 seconds. Work into a full lather and rinse thoroughly and then pat dry. If too much drying occurs, you may need to rinse the cleanser off sooner or use it less often. Consult your doctor or pharmacist for further details. If you are using the liquid wash, cleansing pad, or cleanser bar, use it instead of soap once or twice a day. Wet the skin before applying, gently work up a lather for 10 to 20 seconds, and rinse thoroughly. Do not scrub the skin. If using the shaving cream, first wet the area to be shaved. Apply a small amount of the medication, gently rub into the area, and then shave. If you are using a cream, foam, lotion, or gel, apply it to the affected area usually once or twice a day, or as directed. Before applying each dose, gently wash the affected area with a mild cleanser, then pat dry. Apply a small amount of medicine to the affected area and rub in gently. Some products may require rinsing off after application for a certain amount of time. Check your product package to see if your form of this medication needs to be rinsed off. If you are using the medicated pads or sponges, wash the affected skin with a mild cleanser, then pat dry. Wipe the pad or sponge gently onto the skin to apply the medication, usually once or twice a day to the skin as directed. Dosage is based on your medical condition and response to therapy. Improvement in acne is usually seen after 3 weeks of use, and maximum benefit after 8-12 weeks of use. Use this medication regularly in order to get the most benefit from it. To help you remember, use it at the same time(s) each day. Inform your doctor if your condition persists or worsens. SIDE EFFECTS: Skin reactions such as peeling, itching, irritation, and reddened skin may occur, especially at the start of treatment. If any of these effects persist or worsen, notify your doctor or pharmacist promptly. You may need to apply smaller amounts of the drug or use it less often. Consult your doctor or pharmacist for more details. If your doctor has directed you to use this medication, remember that he or she has judged that the benefit to you is greater than the risk of side effects. Many people using this medication do not have serious side effects. A very serious allergic reaction to this drug is unlikely, but seek immediate medical attention if it occurs. Symptoms of a serious allergic reaction may include: rash, itching/swelling (especially of the face/tongue/throat), severe dizziness, trouble breathing. This is not a complete list of possible side effects. If you notice other effects not listed above, contact your doctor or pharmacist. In the US - Call your doctor for medical advice about side effects. You may report side effects to FDA at 1-800-FDA-1088. In Canada - Call your doctor for medical advice about side effects. You may report side effects to Health Canada at 1-866-234-2345. PRECAUTIONS: Before using benzoyl peroxide, tell your doctor or pharmacist if you are allergic to it; or if you have any other allergies. This product may contain inactive ingredients (such as perfumes), which can cause allergic reactions or other problems. Talk to your pharmacist for more details. Before using this medication, tell your doctor or pharmacist your medical history. This medication may make you more sensitive to the sun. Avoid prolonged sun exposure, tanning booths, and sunlamps. Use a sunscreen and wear protective clothing when outdoors. During pregnancy, this medication should be used only when clearly needed. Discuss the risks and benefits with your doctor. It is not known whether this drug passes into breast milk. Consult your doctor before breast-feeding. DRUG INTERACTIONS: Your healthcare professionals (e.g., doctor or pharmacist) may already be aware of any possible drug interactions and may be monitoring you for it. Do not start, stop or change the dosage of any medicine before checking with them first. Before using this medication, tell your doctor or pharmacist of all prescription and nonprescription/herbal products you may use, especially of: dapsone used on the skin. Keep a list of all your medications with you, and share the list with your doctor and pharmacist. OVERDOSE: This medicine may be harmful if swallowed. If swallowing or overdose is suspected, contact your local poison control center or emergency room immediately. US residents can call the US national poison hotline at 1-800-222-1222. Canadian residents should call their local poison control center directly. STORAGE: Store at room temperature away from light and moisture. Refer to storage information printed on your package for the exact temperature range. If you have any questions about storage, ask your pharmacist. Do not store in the bathroom. Keep all medicines away from children and pets. Do not flush medications down the toilet or pour them into a drain unless instructed to do so. Properly discard this product when it is expired or no longer needed. Consult your pharmacist or local waste disposal company for more details about how to safely discard your product.